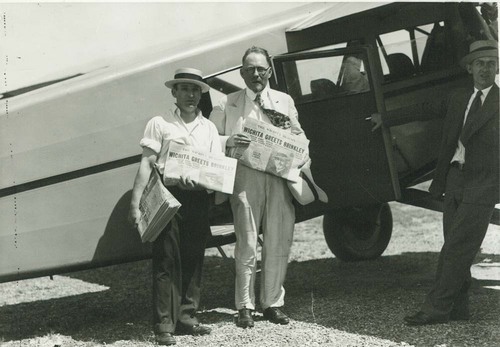 This black and white photograph shows Dr. John R. Brinkley, a physician from Milford, Kansas, standing beside an airplane with two unidentified men. Brinkley became famous for his controversial goat gland transplants and unconventional medical practice. He ran as an independent write-in candidate for governor of Kansas in 1930, 1932 and 1934.